Norvasc belongs to the class of drugs known as calcium channel blockers and is used in the treatment of high blood pressure, angina, and conditions caused by coronary artery disease. Norvasc and generic amlodipine work by relaxing the blood vessels and improving blood flow. Norvasc 5mg and Norvasc 10mg are available in tablet form. Some common side effects of Norvasc include headache, dizziness, fatigue, stomach pain, or flushing. Some serious side effects of Norvasc include faintness, swelling in the hands, ankles, or feet, pounding heartbeat, chest pain (especially that spreads to the arm or shoulder), nausea, sweating, or a general ill feeling. Amlodipine, the generic product is not produced by the same company that makes the brand drug (Norvasc). You can save hundreds of dollars every year when you buy Norvasc online from QualityPrescriptionDrugs.com. We’ve got discount Norvasc and generic amlodipine at incredibly low online prices! 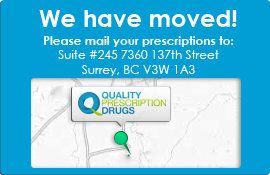 American customers finally have access to safe, affordable mail order prescriptions from QualityPrescriptionDrugs.com. We are a Canadian International Pharmacy Association (CIPA) certified online pharmacy that dispenses Norvasc, generic amlodipine, and many other cheap prescription drugs to patients with a valid prescription. While some online pharmacies sell mail order drugs such as Norvasc without a prescription, these sites are likely not affiliated with a licensed pharmacy and the quality of their drugs cannot be verified. However, QualityPrescriptionDrugs.com is a legal online pharmacy and our customers can shop with confidence knowing they are buying genuine Norvasc. If you have questions about Norvasc, amlodipine, or any of our mail order medications, call us toll free at 1-877-244-0429 Monday to Friday from 6am to 6pm (PST) or Saturday from 7am to 4pm (PST). · Cheap drugs from a reputable online pharmacy · The largest selection of mail order meds · The lowest CIPA price guaranteed – we’ll even match our competitors · Secure shopping from the comfort of home in our online store! Amlodipine (Generic) 4 out of 5 based on 3 ratings. 3 user reviews. Very effective in reducing blood pressure. Exercise helps to reduce swelling in feet and ankles. I had a terrible reaction to this medicine. I felt very sick the entire time I took it. My hands and feet were swollen, I felt nauseous and weak, and I had a strange pain in my back and neck.